Hidden behind a high, red-brick wall on the corner of Møllegade and Guldbergsgade in Nørrebro is Denmark’s oldest Jewish cemetery. Since 1693, Danish Jews have been buried under the tall lime trees and wild-growing plants here in Beit Olam (Hebrew for the House of Eternity), where the atmosphere is at once solemn and informal. The ancient, unostentatious weathered gravestones stand cheek by jowl around the cemetery, among the wild plants that spread across the graves. 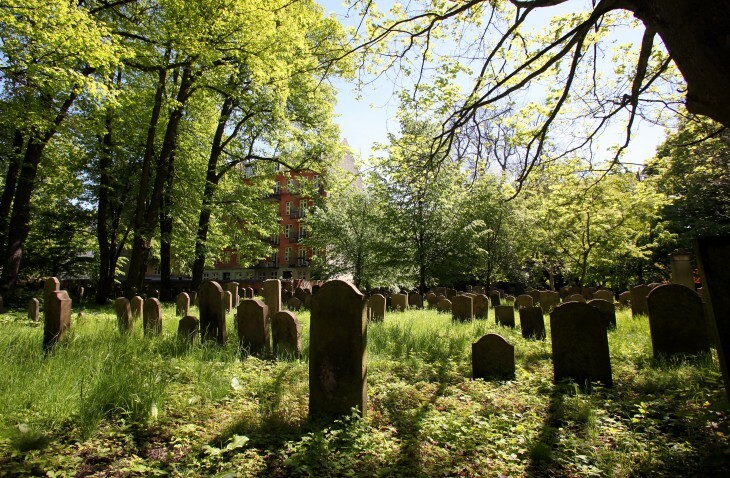 The more than 6,000 people buried here will remain in their resting places for all time – according to Jewish custom, the deceased must never be removed from a grave. Nearly half of the gravestones remain in place, almost all facing the same direction: towards Jerusalem. The site seems both unkempt and uniform because, according to Jewish tradition, all people are ‘equal in death’, so there is no difference between the graves. You won’t see any bouquets here either, as Jewish people don’t pick living flowers to honour the dead, but instead leave a small stone on the grave as a sign of respect. The cemetery was closed for many years, but since 2011 it has been open to the public four days a week. Signs provide information about the site, Jewish customs and the famous people buried here who made an impact on Danish society. Cultural history, peace, quiet and contemplation. The cemetery is open from 1 April to 30 September on Mondays, Wednesdays, Thursdays and Sundays from 10:00–18:00, except on Jewish holidays. Men are asked to wear something on their heads. You can borrow a calotte at the entrance. The cemetery must be navigated by the paths only because many of the graves are unmarked. The Jewish Cemetery in Møllegade was established in 1693. In 1886, a new Jewish burial ground was created at the Western Cemetery but burials continued at Møllegade until 1967. Some tombstones lie flat, in accordance with the tradition among Sephardi Jews from the Iberian Peninsula. Among those buried here are the founders of Bing & Grøndahl; the co-founder of Privatbanken; the father of the founder of Bonnier Publishing; the founder of the Hirschsprung Collection; Hans Christian Andersen’s close friend Dorothea Melchior and Niels Bohr’s parents. Harriet, the first wife of Edvard Brandes, the co-founder of the newspaper Politiken, is also buried here. She committed suicide after being unfaithful to her husband. Brandes, who had a mistress himself, is not buried in the cemetery. He was cremated – which is not in accordance with Jewish tradition. Lime trees, ivy and a mass of natural ground vegetation. There are no benches, and you are not permitted to eat or drink in the cemetery. There are several general stores and cafés in the neighbourhood.